Ghanbarzadeh, B., Oromiehi, A. (2008). Surface Evaluation of Resin Zein Films Containing Sugar Plasticizers by Permeability and Atomic Force Microscopy Analysis. Iranian Journal of Pharmaceutical Sciences, 4(1), 23-30. Babak Ghanbarzadeh; Abdorasul Oromiehi. "Surface Evaluation of Resin Zein Films Containing Sugar Plasticizers by Permeability and Atomic Force Microscopy Analysis". 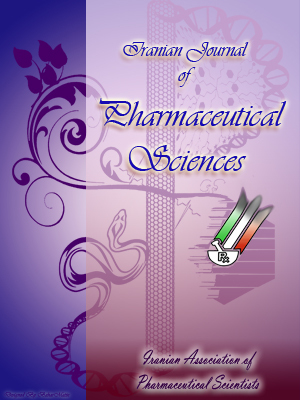 Iranian Journal of Pharmaceutical Sciences, 4, 1, 2008, 23-30. Ghanbarzadeh, B., Oromiehi, A. (2008). 'Surface Evaluation of Resin Zein Films Containing Sugar Plasticizers by Permeability and Atomic Force Microscopy Analysis', Iranian Journal of Pharmaceutical Sciences, 4(1), pp. 23-30. Ghanbarzadeh, B., Oromiehi, A. Surface Evaluation of Resin Zein Films Containing Sugar Plasticizers by Permeability and Atomic Force Microscopy Analysis. Iranian Journal of Pharmaceutical Sciences, 2008; 4(1): 23-30. Zein is one of the best biopolymer for edible film making and sugars are natural plasticizers for biopolymers. In this research, sugars (fructose, galactose and glucose) at three levels (0.5, 0.7, 1 g/g of zein) were used as plasticizers for zein protein films and their water vapor permeability (WVP), oxygen permeability (OP) and atomic force microscopy (AFM) topography were studied. The pure zein films had the highest WVP and adding sugars to 0.7 g/g of zein decreased WVP of the films. In comparison among different zein films, those plasticized by galactose and fructose had the highest and lowest barrier properties, respectively. The zein films without plasticizer had low OP and increasing plasticizers to 0.5 g/g of zein decreased OP values in all samples. The films containing galactose and fructose had the lowest and highest OP, respectively. AFM images were used to evaluate surface topography (a qualitative parameter) and roughness (a quantitative parameter) of the zein films. The films plasticized by fructose had smoother surface and lower roughness than the other films. Interrelation between WVP, OP and the roughness of zein films were not observed. Increased consumer demands for both higher quality and longer shelf life foods in combination with environmental needs for reduction of disposable packaging volume have led to increased interests in the preparation of biopolymers films and coatings [1, 2]. Most of biomolecules including proteins, carbohydrates and lipids have been used to prepare edible films. Lipid based films have proved to be good water vapors barriers but lack sufficient strength to form self supporting films . In contrast, protein and carbohydrate based films have good tensile properties but are poor water vapor barriers compared to lipid films . In addition, protein based films are considered to be better oxygen barriers than many synthetic films. The alcohol-soluble protein films, such as zein (prolamin of corn), wheat gluten, and fish myofibrillar protein films have relatively lower water vapor permeability (WVP) than other protein films [5, 6]. Moisture considerably affects WVP and oxygen permeability (OP) of protein films. This is attributed to the plasticization effect of water on protein films. Water increases the polymer free volume, allowing the segments of polymeric chains increase their mobility . Plasticization affects WVP of zein films. Mostly, films containing no plasticizer had lower WVP values than those containing plasticizer [5, 6]. The ability of films and coatings to diminish oxygen transferring is important for controlling fresh fruits and vegetables respiration. In addition, oxygen causes lipid oxidation, which decreases food quality and shortens food shelf life, so that edible films and coatings can enhance these products shelf life . In general, at low to intermediate relative humidity (RH), protein films have lower OP values than low density polyethylene and high density polyethylene, which are not good oxygen barriers . The OP values of zein films at low RH approach to those of the best synthetic oxygen barriers, ethylene-vinyl alcohol copolymer (EVOH) and polyvinylidene chloride (PVDC). The zein films produced by casting method had higher OP than carbon dioxide permeability . RH considerably affects oxygen barrier properties of zein and other protein films. The micro- and nano- structural characteriza-tions of edible films have important roles in understanding of films properties. With the advent of atomic force microscopy (AFM), new possibilities have been created to evaluate the properties of polymers and biopolymers. One of the most popular applications of AFM is the nondestructive topography and roughness analysis of delicate biomaterials. Nanoscale measurements by AFM, allow quantifying the influence of different factors on the hardness, elasticity and permeability of the film surfaces, which are extremely useful for the design of high performance edible food packaging . Measurements of the topography and roughness can be carried out with extremely high resolution. This technique has been used to characterize the surface microstructures of whey protein films [8, 9]. Structure development and orientation of the cast and stretched resin zein films were observed with AFM by Lai and Padua . AFM images of cast films showed uniform deposition of components with no salient structural features. Sugars are natural plasticizer for biopolymer; however, they have not been used as plasticizers in film making from zein and most of other biopolymers.The objectives of this work were to investigate the effects of sugar plasticizers on permeability and the morphology of the zein edible films and to find correlation between the roughness of the surface and permeability. Zein, regular grade, was obtained from Freeman Industries Inc. (Tuckahoe, NY). Other Materials: Glucose, galactose, fructose, Ca(NO3)2.2H2O were purchased from Merck Corporation. Ethanol (95%) was obtained from Razi Corporation (Tehran, Iran) and it was diluted with distilled water to make 80% ethanol. Zein films were produced according to Lai and Padua research works . Zein dispersions were obtained by dissolving zein in warm (80 °C) aqueous 80% ethanol to make to 20% (w/v) solution. Sugars (fructose, galactose and glucose) were added to the solution at 0.5, 0.7, or 1 g/g of zein and stirred in a mixer at 300 rpm for 10 min. Zein-plasticizer dispersions were precipitated by the addition of cold water (5 °C) as a result of hydrophobic aggregation. Resins were collected as soft solids and kneaded in a mixer for separation of the remaining alcohol and water to obtain cohesive moldable resins. Resins were rolled and then pressed in a hot press (80 °C, 25 MPa) between two metal surfaces to form zein films. Films were dried at room conditions for 48 h. Film thickness was measured with a dial gauge micrometer (B. C. Ames Co., Waltham, MA). Films with ~0.2 (±0.03) mm thickness were used in experiments. Figure 1. AFM images of zein resin films containing 0.7 g/g of zein different sugar plasticizers at 30×30 μm scan size: Galctose (GA), Glucose (GL), Fructose(Fr). These six images were chosen as representatives from each sample scanned at different scan size. WVP was determined gravimetrically according to the standard method E96-95  by WVP tester (L80-5000, Switzerland). The films were inserted between the lower chamber containing distilled deionised water and upper chamber containing sensor for controlling of temperature (23 °C) and relative humidity (15% RH). Air velocity across the films was approximately 750 m/min. Silica gel (desiccant) was used for the adsorption of air water. The moisture adsorbed by the silicagel was detected by weighting it periodically until reaching a stationary state. The final measurement was carried out after incubation for 1 day. The slope of the weight vs time plot was divided by the effective film area to obtain the water vapor transmission rate (WVTR). This was multiplied by the thickness of the film and divided by the pressure difference between inner surface and outer surface to obtain the WVP. WVTR=slope/ film area WVP=WVTR×thickness/ Vapor pressure WVP= WX/A T P where W: weight gain by desiccant (g), X: film thickness (mm), A: area of the exposed film surface (m2), T: incubation period (h) and p: difference of partial pressure (KPa) WVP was measurements of three replicated samples for each type of film. The measurements of OP were carried out based on the equal-pressure method  by an Ox-Tran apparatus (Mocon, Inc, Minneapolis, USA) at 25 °C. The samples were conditioned for 3 day at 50% RH before measurements. In equal-pressure method, the sample is held such that it separates two sides of a test chamber. One side is exposed to a nitrogen atmosphere while the other was exposed to an oxygen gas. Pressure of the two sides is equal but oxygen partial pressure was different. Oxygen permeates through the film and is diverted into the sensor by the nitrogen carrier gas. Testing is completed when the concentration of oxygen in the nitrogen side atmosphere reaches to constant. Oxygen transmission rates (O2TR) of the films were calculated according to the oxygen quantities that were measured by the sensor in nitrogen carrier gas. OP was calculated by dividing the steady-state transmission rate of oxygen gas by the difference in oxygen partial pressure between the sides of the film and multiplying it by mean thickness: P=QX/tA P where P: oxygen permeability; Q: quantity of oxygen; X: film thickness; A: area of permeation; t: permeation time and p: the partial pressure difference of the permeant gas across the film. Permeability was expressed in cm3.μ/cm2. d. kPa. 2.5 μm×2.5 μm scan size and a 74.1 nm vertical range. 2. 5 μm×5 μm scan size and a 239.3 nm vertical range. 3. 10 μm×10 μm scan size and a 1.4 μm vertical range. 4. 30 μm×30 μm scan size and a 2μm vertical range. Two types of cantilevers were used: An NSC12 cantilever (MicroMasch) with a spring constant of 14 N/m, and an AC160TS-2 cantilever (Olympus) with a spring constant of 42 N/m. Three different images were taken of each sample at four scan sizes. The basic principle of AFM is the recording of the deflection of a cantilever over each x and y coordinate of the sample, as it is scanned under the probe. The x and y-registered data were then assembled into 3D surface map. The resulting image from the AFM was a map of forces detected over each point on the sample. where Zi: the height values in profile (histogram) (nm); Z: arithmetic means of heights (nm); and N: the number of data points in the profile. Statistical analyses for tensile properties and oxygen permeability were performed using Spss 10 software (Version 10.0 for windows, SPSS Inc, 233 South Wacker Drive, 11th Floor, and Chicago, IL, USA). The general linear models (GLM) procedures were utilized for analysis of variance (ANOVA). The Duncan's multiple range tests was used to determine any significant difference between specific means at p>0.05. The pure zein film showed the highest WVP probably due to insufficient chains association and formation of considerable void spaces and cavities in films, although films without sugar plasticizer had more hydrophobic nature than the films containing them (Table 1). Permeability is influenced by the hydrophobic or hydrophilic nature of the material, by the presence of voids or cracks, and by stearic hindrance in the structure [12, 13]. Water sorption often results in swelling and conformational changes in biopolymers. Absorbed water acts as a plasticizer in the film matrix, leading to a less dense structure and increasing the permeability. In comparison, among the films containing different plasticizers, the films plasticized by galactose and fructose had the highest and lowest barrier properties, respectively. This could be attributed to lower hydrophilic nature of galactose than glucose and fructose. Increasing content of plasticizers from 0.5 to 0.7 g/g of zein, decreased WVP. However, when content of plasticizers were increased to 1 g/g of zein, WVP increased in most specimens. This could be attributed increase chain mobility and void spaces between the polymer chains. Parris and Coffin  studied the effect of several plasticizers and crosslinking compounds on the water vapour permeability of casting zein films. Water vapour barrier properties were best for unplasticized zein films cross-linked with 20% polymeric dialdehyde starch and incorporation of plasticizers into the zein films resulted in an almost doubling in WVP values. However, we observed decrease in WVP at low level of plasticizer. The AFM technique is a powerful tool for studying surfaces and it has been used to provide qualitative and quantitative information about biopolymers in nanometer scale that are often inaccessible by any other experimental technique . AFM can be useful to identify structural differences of the films prepared by different methods. The morphology (qualitative parameter) and the roughness (quantitative parameter) of the zein films were analyzed by AFM. Topography images showed that films containing fructose had smoother surfaces than those containing glucose and galactose (Figure 1). The films plasticized by galactose had the highest projections. Table 3 summarizes roughness parameter (R q) of different zein films in different scan sizes. As shown, in all scan sizes, films containing fructose and galactose had the lowest and highest Rq, respectively. Herrmann et al. used AFM for evaluating the surfaces of edible films produced with whey protein concentrate (WPC). The effects of WPC and plasticizer concentration on WVP and roughness parameters were characterized. Their results showed a relation between water vapor permeability and area roughness. The results of this research work did not show any relationship between WVP and roughness of different films. Moreover, there was not suitable correlation between OP and roughness. Table1. Water vapor permeability of zein films. *Values are average of five samples ±S.D. Table2. Oxygen permeability of zein films. Table3. Comparison of and Rq values obtained from AFM images of different films. The pure resin zein films had weak barrier property against WVP. Increasing plasticizers level to 0.7 g/g of zein, decreased the WVP of zein films but when plasticizers content were increased to 1 g/g of zein, WVP increased again. The films plasticized by galactose and fructose had the highest and lowest barrier properties, respectively. These phenomena were attributed to lower hydrophilic nature of galactose than glucose and fructose. Similar to WVP property, the pure zein films had low OP and OP values decreased with increasing of plasticizers to 0.5 g/g of zein in all samples, significantly (pIt was probably due to increase association between polymer chains at low level of plasticizers. Increasing sugars to 0.7 and 1 g/g of zein, increased OP of zein films drastically. The zein films containing galactose showed the lowest OP values, whereas the films plasticized by glucose had lowest OP values. AFM surface analysis showed the films containing fructose had smoother surfaces than other films. As well, the films plasticized by fructose had the lowest roughness. We could not observe correlation between the roughness and permeability of the zein films. The authors wish to express their gratitude to Iran National Sciences Foundation (INSF) for financial support. We are thankful to Iran Polymers and Petrochemical Institute and University of Tehran for supporting the facilities for this research work and technical assistance. Cuq B, Gontrad N, Guilbert S. Proteins as agricultural polymers for packaging production. Cereal Chem 1998; 75: 1-9. Ghanbarzadeh B, Oromiehi A. Investigation of water vapour permeability, hydrophobicity and morphology of resin zein films plasticized by polyols. Iran Polym J 2006; 15: 555-64. Ghanbarzadeh B, Oromiei A. Effect of plasticizing sugars on rheological and thermal properties of zein resins and mechanical properties of zein films. Food Res Int 2006; 39: 882-90. Krochta JM. Proteins as raw materials for films and coatings: definitions, current status, and opportunities. In: Gennadios A, (Editor). Protein-based films and coatings. Boca Raton: CRC Press LLC, 2002. Ghanbarzadeh B, Oromiei A. Effect of polyolic plasticizers on rheological and thermal properties of zein resins. Iran Polym J 2006; 15: 779-87. Lai HM, Padua GW. Properties and microstructure of plasticized zein films. Cereal Chem 1997; 74: 771-5. Gennadios A, Weller CL. Edible films and coatings from wheat and corn proteins. Food Tech 1990; 44: 63-9. Herrmann PSP, Yoshida CMP, Antunes AT, Marcondes JA. Surface evaluation of whey protein films by atomic force microscopy and water vapour permeability analysis. Packag Technol Sci 2004; 17: 267-73. Lent LE, Vanasup LS, Tong PS. Whey protein edible films determined by atomic force microscope. J Food Sci 1998; 63: 824-7. Standard test methods for water vapor transmission of materials. In: Annual book of ASTM standards. E96-95, Philadelphia: American Society for Testing and Materials: 1994; pp: 65-70. Lai HM, Padua GW. Water barrier properties of zein films plasticized with oleic acid. Cereal Chem 1998; 75: 194-8. Standard test method for oxygen gas transmission rate through plastic film and sheeting using a colorimetric sensor. In: Annual book of ASTM standards: D3985-95, Philadelphia: American Society for Testing and Materials: 1995. Parris N, Coffin DR. Composition factors affecting the water permeability and tensile properties of hydrophilic zein films. J Agricul Food Chem 1997; 45: 1596-9. Gennadios A, Weller CL, Testin RF. Temperature effect on oxygen permeability of edible protein-based films. J Food Sci 2003; 58: 212-4. Elofsson C, Dejmek P, Paulsson M, Burling H. Atomic force microscopy studies on whey proteins. Int Dairy J 1997; 7: 813-9.